← End of summer already? 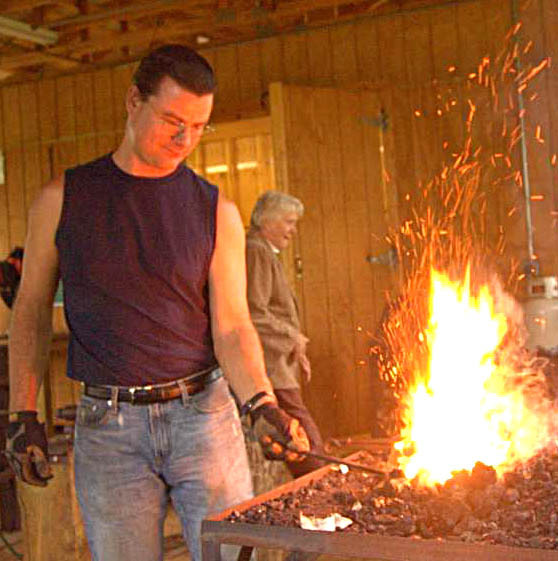 Sean Pecor, horse farmer, blogger and Internet entrepreneur from Boone’s Mill, VA, is learning blacksmithing at the Jacksonville Center for the Arts in Floyd, Virginia. Sean was the winner of a design contest sponsored by the Jacksonville Center and won a scholarship for any course or workshop that was being offered. I had lost track of Sean since the contest, and was pleasantly surprised to see him firing up a forge and forming hot metal on an anvil like he had been doing it all his life. He exhibits the same easy confidence in the Blacksmith shop as he does on his weblog. He is taking the Introduction to Blacksmithing course being taught by third-generation blacksmith, Jessie Ward. The description of the course gives you some idea of the material covered. Enjoy the thrill of making things with iron. 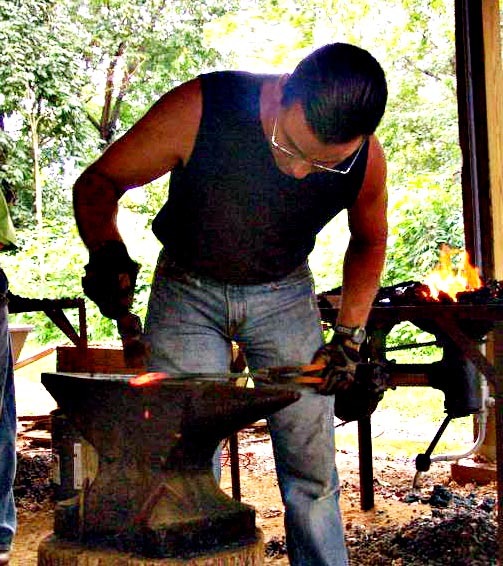 This three day introductory course is designed to cover blacksmithing basics, make something you’ve always wanted to make or make things you didn’t realize were possible. No previous blacksmithing experience is required. All levels welcome. This course is taught on three successive Saturdays, so I will follow up next week to see what Sean is going to do next. I have been taking pictures of all of the courses we offer, and I think blacksmithing is one of the first I am going to do myself. I don’t think I will match Sean’s stylish appearance, but I will enjoy bashing hot iron, I am sure of it!